It should go without saying that our veterans deserve wholehearted respect and honour. Having sacrificed so much for us, the least we can do is give them those things. Sadly, as many veterans grow older, and their achievements and acts of selflessness are whittled away by the ageing of time, they can be forgotten by society. That’s why stories like this one don’t just make us smile … they set an example for all to follow. Thomas Hunter served from 1942-1949 and participated in the D-Day invasion during World War II. Despite his heroics, Hunter never married when he returned home; never started a family. He had 11 siblings, but by the time he passed away, at the age of 93, he had outlived all of them. 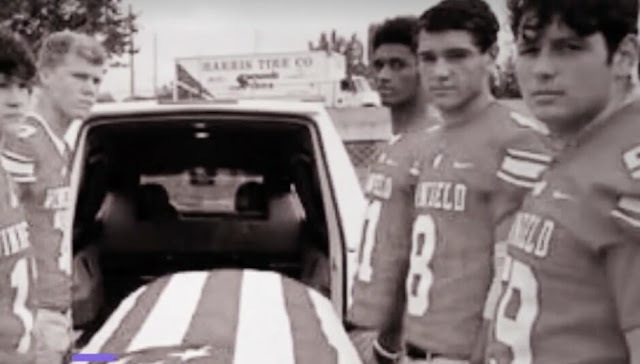 His only surviving family members were a few nieces, and so when it came to planning his funeral they weren’t sure who to get to carry his casket. Bankston spoke with Matthew Harrell, Brett Jurek, Justin Lawson, T.J. Homan, Christian Evans, and Lee Estay to see if they minded getting involved. Every single one of them gave a strong yes. 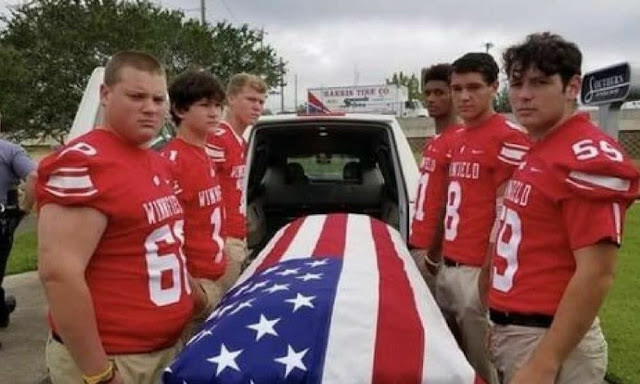 On the day of the funeral, the six teens arrived in their football uniform to carry Hunter home. They performed their duties during a sombre ceremony and gave Hunter the send-off that he deserved.